Three Saturdays ago, Kristen and I spent an entire day applying two coats of paint to our hallways, living room, and dining room. This past Sunday, Kristen spent the whole day painting the kitchen. Same color, two coats. Gravity is a light gray with calm blue tones that sneak out when met with sunlight. It was a lot of hard work, especially for Kristen. So I thought I'd mix her up a new cocktail. I started with the Gin-Basil Smash recipe for inspiration. 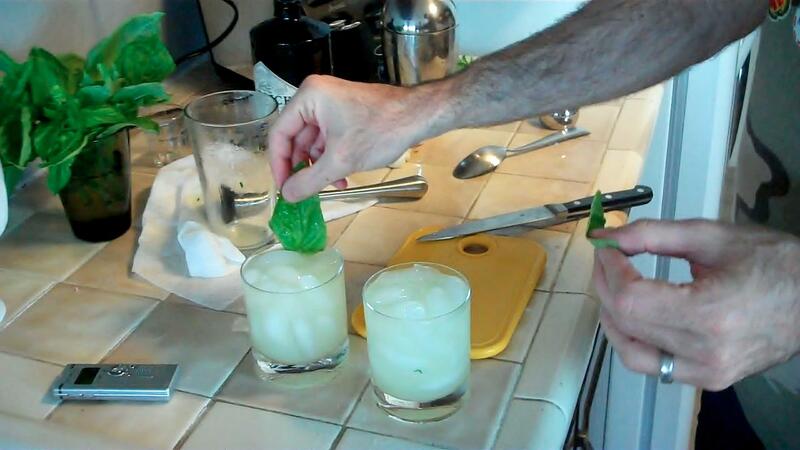 For one drink: Muddle one bunch of fresh basil with a quartered half-lemon and 2/3 oz. of simple syrup. Then add 2 shots of Hendricks Gin. Shake with ice and serve on the rocks. For two drinks, muddle at least two bunches of fresh basil (err on the side of more) with a whole quartered lemon and 1/2 shot of simple syrup. Add two shots of Hendricks Gin, shake until the shaker is too cold to hold. Serve on the rocks with a fresh basil garnish. It's very refreshing and strong enough to alleviate the labors of the day. Thus the Anti-Gravity Cocktail. Here's a quick video I made of it. Enjoy!